"Surely I was sinful at birth, sinful from the time my mother conceived me" (Psalm 51:5). Every human being sins. Sin is often defined as missing the mark. It is a failure to live up to God's requirements. We sin because we have a sin nature. Every human being possesses a sin nature -- a corrupt nature inherited from Adam. 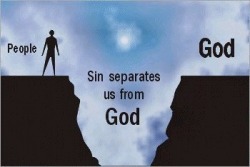 Our sin nature separates us from God: "The result of one trespass was condemnation for all men" (Romans 5:18). Christians have two natures at work in their being -- one is the old sin nature, and the other is a new nature controlled by the Spirit. These two natures are constantly at war with each other. Paul explains that, despite his best intentions, he is still influenced by his sin nature: "I have the desire to do what is good, but I cannot carry it out. For what I do is not the good I want to do; no, the evil I do not want to do -- this I keep on doing" (Romans 7:18-19). While our two natures are constantly in conflict, it is not the sin nature that will ultimately control the Christian. Part of the sanctification process involves dying to the old nature. The Christian will sin, but the Christian will not continue in unrestrained sin: "You, however, are controlled not by the sinful nature but by the Spirit, if the Spirit of God lives in you" (Romans 8:9). Sin in the Christian's life will be followed by remorse and repentance. At Christ's second coming, when the believer's body is glorified, the sin nature will be destroyed once and for all. Until then, we are told to resist the sin nature's temptations. God is faithful; He will not let you be tempted beyond what you can bear. But when you are tempted, He will also provide a way out so that you can stand up under it" (1 Corinthians 10:13).